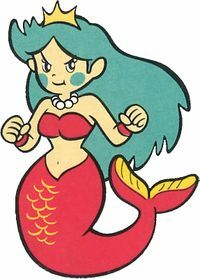 Mad is a mermaid boss in the Nintendo Entertainment System version of the game Wario's Woods. Mad is the third boss overall that Toad faces in the NES version of the game and she makes her debut in the twenty ninth round. She is depicted to having blue hair (green hair in her original sprite) and a red tail in her official artwork, as well as a crown and a pearl necklace. Mad has the ability to temporarily freeze Toad's sprite helper during battle. Like the other bosses, she is also able to re-locate herself anywhere on the stage and if she re-materializes on Toad, she will instantly knock him out. Mad is also capable of throwing enemies around the stage. Mad participates in helping Wario keep control of the woods. While neither Mad nor any of the other bosses of the NES version of Wario's Woods reappear in the SNES version of the game (excluding Wario), she bears a strong resemblance to Aqualea. Meidō Maido, derived from "mermaid"